Long before I started reading romance and urban fantasy, my drug of choice was mystery novels, the more complex the better. And the mystery at the heart of Bronze Gods was a nice juicy one I could sink my teeth into. Janus Mikani and Celeste Ritsuko have been Criminal Investigation Division partners for three years. They work the late shift and tend to catch the oddball cases, and the one they’re tossed in Bronze Gods is no different: a House scion has gone missing. What starts as a missing persons case quickly turns into a hunt for a murderer when the young woman is found dead and strapped down to a curious machine. Her body has been burnt to a crisp by a device consisting of many, many mirrors. It’s not long before another young woman goes missing and winds up dead, bound inside another machine. 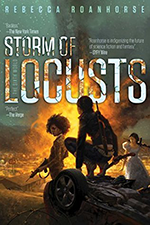 With the Houses and the Summer Clan demanding justice and the city of Dorstaad in chaos, Mikani and Ritsuko will have to work ‘round the clock to stop the murderer before he strikes again. Mikani has some Ferisher, or fey, blood running through him, giving him a sort of sixth sense, one that allows him to pick up emotional echoes and traces. Combined with Ritsuko’s meticulous note taking, observation skills, and research abilities, they make a formidable team. Their banter makes you forget they’ve only worked together for a short period of time, and when they both find themselves single at the same time, their relationship takes an…interesting turn. Mikani and Ritsuko may very well be my new favorite non-couple couple. The tension between the two builds gradually, with odd moments and shared intensity. I wouldn’t call it sexual, more like romantic. Because for them you get the sense it’s just as much about the heart as it is about the body. With the dedication both show to the job, it’ll be interesting to see how, and if, it develops. 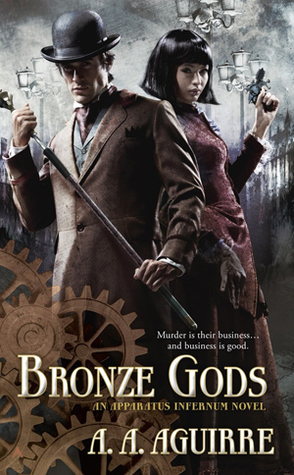 While there are definite and clear steampunk elements in Bronze Gods, they don’t play a huge role, except in the murder machines the killer uses to perform his dirty work. There are threads of magic and hints of an old way of life, when the fey lived in a hidden world, untouched by mortals. The ten Houses that eventually came to be were the product of fey and human matings. There’s a lot of complex world building going on here, and it’s woven into the story with a deft hand. There are a few points where the pace drags a bit, but that makes it a little more realistic. Mikani and Ritsuko run into a lot of dead ends, spend some time chasing down tiny details they aren’t sure how to fit into the larger puzzle, and go without a solid lead for a good chunk of the story. My bigger complaint was it was pretty easy to figure out who was going to end up one of the killer’s victims fairly early on. I adored this book. Even when it slowed down I wanted to keep reading, and I really didn’t want it to end. The consequences for the actions they take to solve the case are likely to reverberate for a while, and combine that with Mikani letting down his guard, just a smidge, makes me eager to read the next book. Ooh, this sounds outstanding. I like some of Aguirre’s other series, and I’ve been interested in this ever since I saw the cover and blurb. But this seals the deal. I’m in! Yes! I’m impatient for the next book, that’s how much I enjoyed reading this. 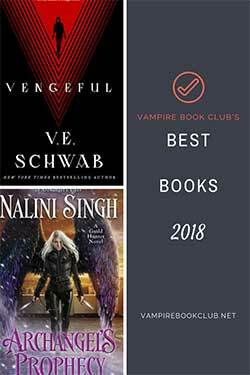 Have this book in my TBR pile. Now I will have to move it up! wonderful, I have this one, now I just need to read it!